Now that my time is my own and the weather has finally become more conducive to gardening, I’ve been outside getting my hands dirty. John tilled up the garden for me some weeks back, but it was too wet and cold to do much planting until the middle of May. At last we had a couple consecutive days of warm, dry weather, and I was able to rake the earth into garden rows, cover everything with weed blocking fabric and put in my seedlings and support systems. This year I decided against planting green beans and yellow wax beans. They’ve been big producers for me the past two years, but to be honest, after eating them two and three times a week last summer, John and I are sick to death of them. I also opted to plant potatoes in containers this year (see previous blog), so I had a lot of arable footage freed up. I put in seven tomato plants: four Romas and one Sweet 100s Cherry (I put these in every year), as well as a Black Krim and a Mortgage Lifter. The latter two are heirloom varieties which I haven’t attempted before – I decided to give the Brandywines a rest this year and try something new. 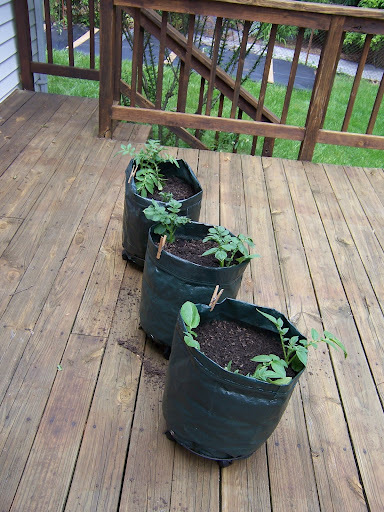 I also put in a jalapeno pepper, sweet basil, two varieties of cucumber (Straight Eight and Bush Whopper). Last year I tried out a new kind of vegetable support called a cucumber trellis; the idea is to get the vines and their resultant produced up off the ground, and I was really happy with it. I bought a second one, and this year I’m using it to support two Sugar Baby watermelon plants (the melon seedlings are on the right in this photo; the second trellis arrived the day after I took the picture). It looks like there’s an awful lot of room in the garden, but trust me: once the cukes and melons get going, they’ll take over the joint. The potatoes are doing quite well in their deck containers. They started sprouting within a week of planting and I’ve already had to unroll the planting bags almost completely in order to “hill up” the sprouts. I’ve potted up sage, cilantro, dill and lemon verbena and have those out on the deck, as well as most of the house plants. 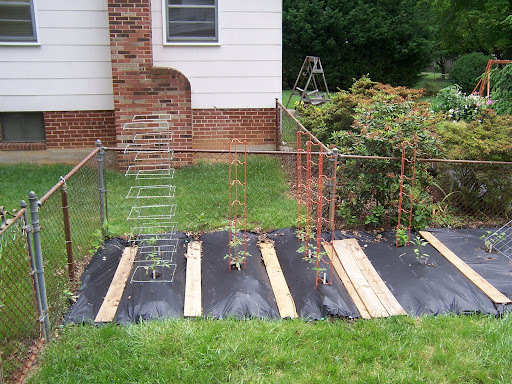 Our big challenge this year was devising some way to keep the squirrels out of the tomatoes. Last year I lost roughly eighty percent of my crop to marauding gray squirrels and their little cousin the chipmunk. A late attempt at netting up the plants turned into a giant and ineffectual mess (see last year’s blog here, so I knew if we were going to do it, we needed to have a plan and we needed to start early. I described what I wanted to John, and together we went shopping for nine-foot poles, deer netting, ground staples and zip ties. We started by planting poles upright at each corner of the tomato patch, forming a rectangle. Then we laid perpendicular poles across the top of the rectangle and zip-tied them in place. We unrolled the deer-netting (it’s ten feet wide) and zip-tied it around the perimeter of the rectangle, leaving a good four to six inches of excess at the bottom. While John worked securing the netting at the top, I went inside the cage, pulled up the weed-blocking fabric at the edges of the rectangle, drew the excess netting inside, then pinned the excess netting underneath the fabric. This way, if a critter tries to go underneath the netting, it’ll be blocked by the fabric. John placed two poles at right angles on top of the cage and zip-tied the resultant cross to the rectangle. 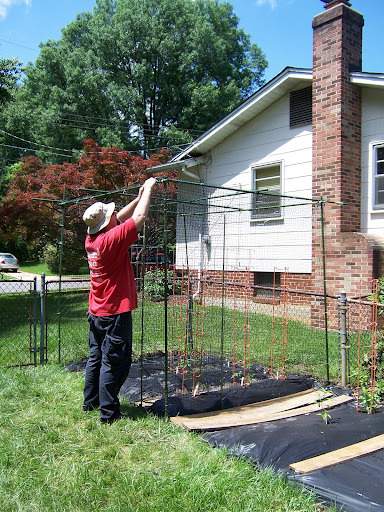 We then spread more deer netting across those poles and zip-tied it down, creating a roof to the cage. 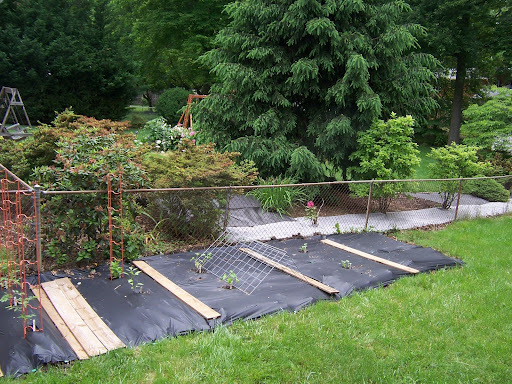 On the off chance that a squirrel attempts to climb the netting, it still won’t be able to get at the tomato plants. 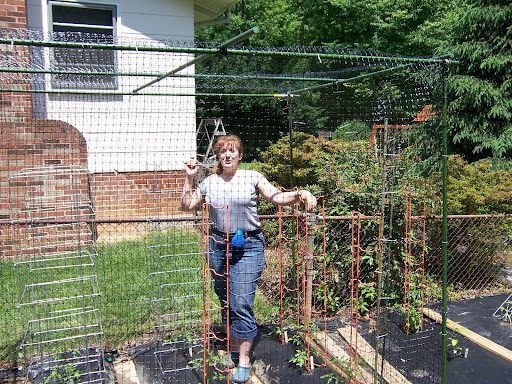 For a doorway, we designed the cage so that the deer netting overlaps at the front, and at this overlap I didn’t pin the netting into the ground. We wove some shorter poles into the netting at both vertical edges of the overlap. Using the two shorter poles like the edges of a bathrobe, we wrap the netting past itself and poke the shorter poles into the ground to hold it in place. This closes the “doorway” to the cage; to open it, we just “unwrap.” Although a determined critter could burrow under the netting at this point, we think that the multiple layers of netting might be somewhat off-putting. So that’s our grand experiment for the garden this year. I’m hoping the Anti-Squirrel Cage will do its job and keep those bushy-tailed varmints out of the tomatoes, and that I’ll reap the benefits of a bumper crop this year! You are turning into a gardener Donna, Dad would be proud if he could see your pictures. Don’t forget to water and you look like you got the weeds under control.Best of growing luck. It worked, up to a point. A determined squirrel can get underneath the bird netting, but then can't figure out how to get out. I've had open the netting on one side and chivvy frightened squirrels out of the contraption, and the leaping around they do when they're trapped breaks off branches and fruit – not good.I decided against using the squirrel cage this past year and did all right. The squirrels didn't seem as bad – maybe it's a cyclical thing!